Stob What better occupation, at this time of year, than to polish up one's IT skills with some background reading? What have the great programming publishers got lined up for our delectation in 2011? Alas, as far as this reviewer is concerned, these rhetorical questions must remain unanswered. A certain Amazon parcel, containing several kilos of Addison-Wesley's and O'Reilly's latest, is delayed-believed-lost in the region of the Park Royal depot, and I haven't got time to go running off to shops to acquire replacements. That tap-tap-tapping at the window is Dudley Deadline, and he is wearing his mean face. This is the sort of situation that distinguishes the ovine from the caprine. But have no fear. My name is Verity, and I am your Nanny for today. We can get through this; we have seen worse. It so happens that I do have to hand a couple of paperbacks, freshly bought, which represent a very Swedish approach to modern software issues. And we all know how important the Swedes are becoming in our speciality, what with Joe Armstrong and everything. If you are sitting comfortably, I shall begin. The late Stieg Larsson's book is a quaint, nostalgic look back at the very early days of the computing - ie five years ago - masquerading as a ripper thriller. The text was originally written in Swedish, but has been translated into idiosyncratic English for the convenience of Anglophone readers. The translation contains various curiosities. The computer abbreviations are spelled out with full stops, thus: 'A.D.S.L'. This makes them look like defunct trade unions, as referenced in yellowing press cuttings from the mid-1960s. One wonders: what has the Association of Domestic Servants and Loafers got to do with the Interweb? However the 'AK4', apparently a kind of rifle (see p10), is presented unpunctuated, following some linguistic algorithm that I do not pretend to understand. 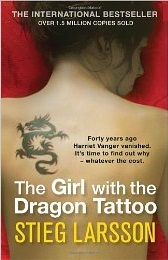 We may be confident that Stieg Larsson was an Apple fan. Not only does he make the hero purchase an early model iPod as a Christmas gift, Stieg actually stops the action and uses the narrator's voice to recommend an OS X shareware program called 'Notepad' (a very confusing name for Windows users), even bothering to supply its url in the text. Do you notice anything? Just as the moral allegiances of cowboys used to be identifiable by the colour of their stetsons, author Larsson distinguishes a good egg from a bad one by the egg-in-question's choice of computer. The heroes are all equipped with Macs; the villains must click through their wretched and perverted lives with Windows. God knows I carry no spear for Microsoft, but I do think this is taking fanboism a bit far. Stob Is that a dead parrot in your pocket, or are you just trying to please me?